Over the weekend I, Kaylee, attended our church's Ladies Retreat. Three nights and three days of almost pure Spanish! I survived! It was such a good experience and really stretched me in the language. I skipped one session halfway through to take a break but other than that I participated the whole time. This is a huge step and was very encouraging for me! 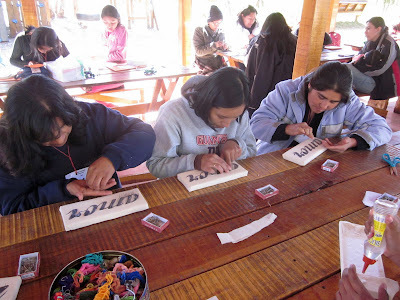 Our time was spent listening to two speakers, devotions, crafts, conversations, a bit of time in a frigid pool, eating and generally having a good time. The two ladies that shared with us both work with Palabra de Vida (Word of Life) and both had great topics that I believe were really good for all of us to hear. One of the women is from Argentina and I struggled a bit with her accent but otherwise understood pretty well the majority of the teaching. My roommates were my good friend Suellen and another older single lady in the church, Vicky. We were spoiled by only having three in our room (some had 11!). Each day we did the devotions together and I could tell that Vicky was trying to stretch me in the language, having me read and share my thoughts instead of just being silent. It was good for me. I had the opportunity to have several one on one or small group conversations that allowed many of the women to see how much I have progressed in my Spanish. Many of them haven't had the opportunity to talk with me (and I have to say I'm pretty shy about using it on Sundays) so that too was very encouraging. I had many say, "You can talk now! And you understand!" 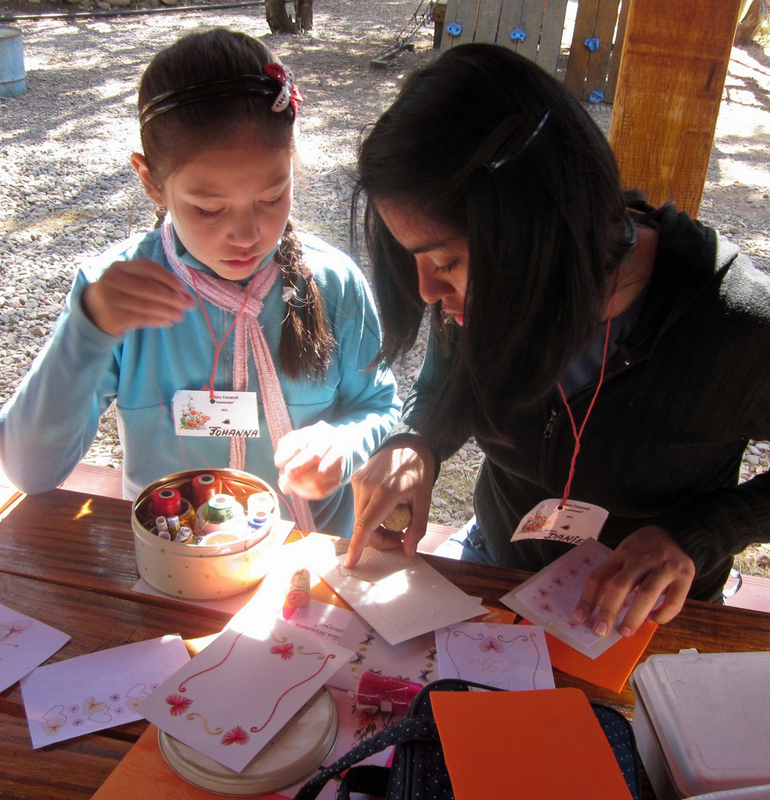 Another area that I was stretched a bit was teaching a craft. 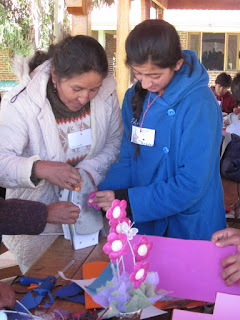 Upon arriving in Bolivia I quickly received the reputation of being a crafter so when there is an opportunity to craft in the ladies group I am often asked for ideas. Over the weekend I taught one of the four crafts. It was a little crazy but it worked and several accomplished what they had set out to do so I was pleased. We ate very Bolivian foods over the weekend. To give you an idea: every morning we had some bread with tea, coffee or drinkable oatmeal. The last morning we were also served a drink that is pretty common here: cornstarch thickened water with a bit of orange juice mixed in for flavor! For lunch we had a full almuerzo: soup and seconds. The bowl of soup would be a complete meal for me usually but then we were also served meat, rice or noodles and always boiled potatoes as our seconds. For dinner (at 8:00pm) we were served more rice or potatoes and a very small amount of meat. They do not consume a lot of vegetables and we were given a piece fruit (banana or mandarin) as dessert or for refreshment between sessions. 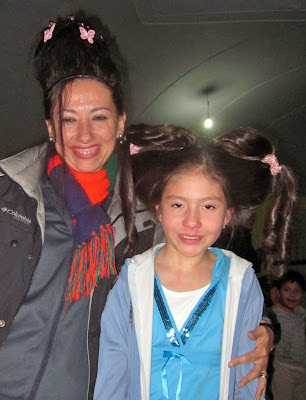 Our pastor's wife and daughter with their crazy hair! On Saturday we had some special events. First, I got my hair cut! One of the ladies took classes to be a beautician, although her job is cleaning, so she took the time to cut hair for several ladies. Then they had a competition that night that included crazy and original hairstyles. We all had a good laugh. I was one of the two judges. After the hair competition there was a long night of games. I was unable to participate due to a foot injury but had a great time watching them. I also retired early after too many late nights, early mornings! All in all it was a great weekend. My pastor's wife's comment when we were leaving was, "You're tired but you're not stressed." That sums it up for me. It was really encouraging to walk away not stressed. That means that I am understanding the language and culture much more and communicating much more. I am no longer an island in the group, unable to participate. It's awesome to see how far I've come. God is good! First Photos Of The New House! I Dream of. . .Houses?